As has been increasingly more recognized in recent years, self-assembly is not a purely thermodynamic phenomenon, it can also be limited and control by the kinetics and dynamics. Kinetic pathways, and manipulation of these, are essential for fabrication of defined nano-assemblies in many of the same ways as is familiar from chemical reaction processes. Just as in organic chemistry where reaction mechanisms control the product and yield, the structure of self-assembled materials are controlled by the kinetic pathways involving e.g. nucleation phenomena, molecular exchange, structural rearrangements and fusion/fission processes. Similarly, in biological systems similar processes are of key importance in e.g. cellular transport processes, signalling etc. 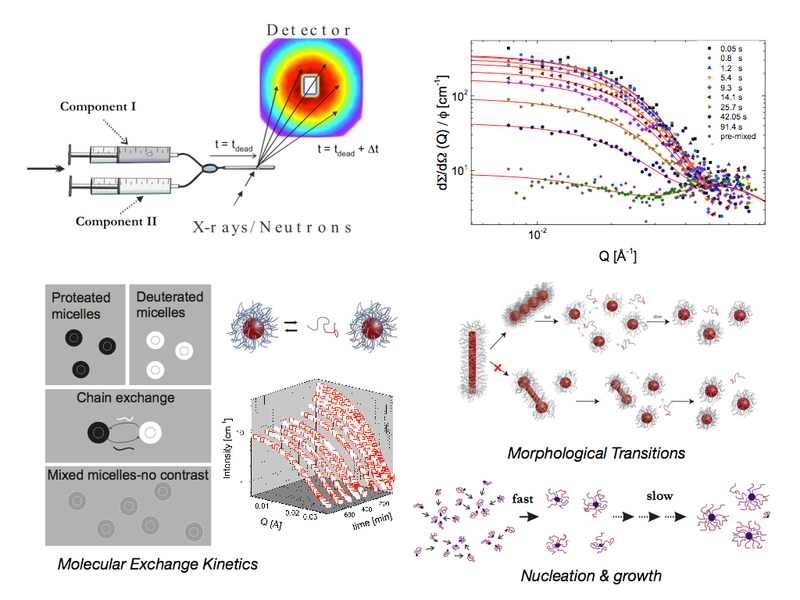 Structure and kinetics of a wide range of self-assembled systems can most conveniently be studied using X-ray and neutron scattering techniques as described in our recent review. 5 However, experimental observation of the kinetic processes of self-assembly is generally very challenging because of the wide range of both temporal and spatial scales involved. Typically, the nucleation processes take place on short time scales of the order of microsecond-millisecond, which contrasts the very slow time scales of activated diffusion and structural reorganization processes. Often the faith of the final structure is sealed already under the nucleation process, which occurs typically in the millisecond or sub-millisecond regime. Thus, ideally we would also like to see the structure evolution of the process to keep track of possible metastable intermediates in analogue with what is commonly observed under chemical reactions. For this, time-resolved scattering techniques are ideal as the structure is encoded in the angular dependence of the scattered intensity. Neutron scattering is particularly useful as selective deuteration of molecules or parts of molecules, opens up many possibilities for contrast variation in order to label and highlight specific parts of the structure or to watch specific kinetic processes. In addition, with more powerful sources, neutron spin-echo spectrometers are capable of approaching the microsecond regime. The gap to modern time-resolved small-angle scattering thus starts to close and opens up a possibility to study the direct link between polymer dynamics, diffusion and kinetic transport processes. Kinetics and molecular exchange processes of self-assembled peptides.